THE TV WHEEL: Joel Hodgson’s Lost Attempt To Reinvent Television | Birth.Movies.Death. The creator of MST3K shot a pilot in 1995 so ahead of its time it wouldn't make sense until the YouTube era. This week I almost saw Joel Hodgson cry on stage. The creator (and best host) of Mystery Science Theater 3000, Joel visited the Cinefamily in Los Angeles as part of the third annual Everything Is Festival. He was doing a show and tell, sharing with the audience some of the things that had shaped him as a comedian, including a bunch of severely bizarre ventriloquist dummy catalogues. But it wasn’t the dummies that choked Joel up. It was his HBO pilot, The TV Wheel. Joel had poured tons of effort (and his own money) into the concept, had shot something for HBO, and had found it roundly rejected. The pilot eventually aired on the Comedy Channel in a butchered format, so nobody had ever seen The TV Wheel the way it was intended. Driving towards the Cinefamily, Joel told us, he began crying, the immensity of his grief over the failed project finally hitting him. And as he stood on stage he warned us he might cry again as he took us through his attempt to reinvent television comedy. I’ll be honest: having now seen The TV Wheel as it was meant to be seen, I understand why HBO passed on it. This doesn’t mean I didn’t like the show - I think it’s borderline brilliant and that, given time to grow, could have blossomed. But it’s a strange show, with a tone unlike anything on the air at the time (1995). In many ways The TV Wheel was created in the wrong time period. It was either 25 years too late or 25 years too early. The premise is simple on paper, but proved to need plenty of explaining on air: A stationary camera sits in the middle of a giant turntable. Sets spin around the wheel, resting in front of the camera, and a short sketch plays out. The whole thing happens live, in real time, without any cuts or edits*. At first it’s unclear what the point of the whole thing even is, and there’s a frantic nature to the endeavour that’s off-putting. But as the show goes on, a rhythm is established, and sketches begin to break the walls of their own sets and the wheel itself is manipulated in different ways, going back and forth. The conceit makes use of deep focus backgrounds, which allows comics far from the camera to interact with props nearer to the camera, giving a delightfully false sense of scale. The TV Wheel feels like a descendant of Laugh-In (acknowledged in the show, where there’s a ‘Sock it to me’ punchline) but also like an antecedent to modern YouTube comedy. Surreal, fast-paced and aggressively visual in its puns and comedy, The TV Wheel probably would have felt both overwhelming and old-fashioned in 95. But today it fits and it works. Part of that comes from Hodgson’s astonishing casting. 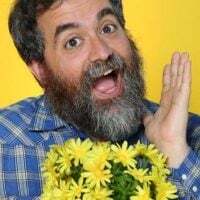 The faces on screen are a mix of mid-90s Comedy Channel mainstays like Fred Stoller and Nick Bakay with people who would be very famous a decade later, like David Cross, Doug Benson and Paul Feig (Judd Apatow was a writer on the show. This was four years before Freaks & Geeks). But part of it comes accidentally. When Hodgson conceived the show it was with the idea of the TV as a window; until the 21st century TVs were immovable objects in our homes, things that just sat there and opened a portal to other people and other worlds. The TV Wheel was looking to play with that using the motionless camera in conjunction with the constantly moving wheel. But now our screens are mobile. The window is portable. Instead of feeling outdated, The TV Wheel now feels prescient, like it was foreseeing a future where the screen is constantly on the move. Attention spans have been on the wane for decades, but The TV Wheel truly saw our blip-oriented culture coming. It’s also very funny. There’s a lot of broadness in the comedy (something that maybe didn’t sit right in the 90s), and a ton of absurdity. Not everything hits, but it’s all so fast that it moves right on to the next thing. And the structure of the show has bits repeating and getting referenced, so something that didn’t hit in the first five minutes kills at the end. The TV Wheel’s Comedy Channel airing is available on YouTube, but I cannot stress enough that this is the wrong way to watch the show. The whole thing is about momentum, and cutting into that with commercials or any edits kills the entire concept. A pay cable station was the only way to go (at the time. The whole shows could have been created with YouTube in mind), and HBO just didn’t understand it. It’s hard to hold it against them - Joel was really ahead of his time with the concept. * When the show aired on Comedy Channel it was chopped up to allow commercials.